In the aluminium toolbox market a lot of companies sell toolboxes of varying thickness, this creates a lot of confusion for customers – we set out to demonstrate with practical testing just what thicknesses are available and what it means in real life situations. For this demonstration we produced our MRT23 chest style toolbox in three different thicknesses:1.5mm, 2mm and 2.5mm (the thickness we use for this box). Whilst these numbers sound very close our demonstration showed just how big the difference is. We conducted two seperate tests a ‘flexibility’ test and an ‘impact test’. Below you can see the results for each, you can also check out the live footage here on our YouTube channel. It is to be noted that each box was built identical to our standard MRT23 toolbox including bracing underneath the lid. The only difference between the boxes was the thickness of aluminium they were made with. We don’t always use 2.5mm for our toolboxes, we use the appropriate thickness for the strength required in the particular box to make it heavy duty. 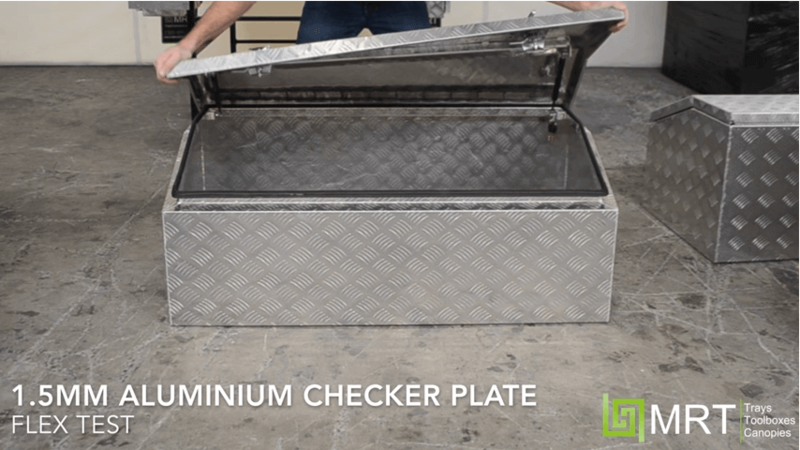 To find out the correct method of measuring your aluminium checker plate you can check out our article on how to correctly measure aluminium checker plate.